An industrial waste water treatment company required a cost effective solution to pumping liquid polymer. 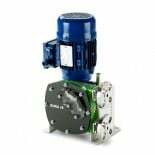 A company that designs, manufactures and constructs industrial waste water treatment plants was in need of a pump to pump a polyelectrolyte, and had been previously using a helical rotor pump but was unhappy with the costs. This was quite the challenge, as the pump needed would have to be able to transfer liquid polymer, which is a thick, viscous liquid with a kerosene (hydrocarbon) carrier of around 30%. As well as finding a more cost effective solution than a helical rotor pump, plus something that was compatible with the customer's current system, it was also requested that the hose would last longer than 3 months.